DieHard Wolfers :: View topic - Is DOS Wolf modding a thing of the past? Is DOS Wolf modding a thing of the past? Subject: Is DOS Wolf modding a thing of the past? So I'm curious, what is it about DOS/Wolf4GW that makes you avoid it in favour of Wolf4SDL/ECWolf? Do you detest the limitations of the former, or simply prefer the ease of use with the latter? Subject: Re: Is DOS Wolf modding a thing of the past? I honestly only logged into this forum in 2016 because Barry started talking about DOS. DosBox is not comfortable. Memory limits are pain in the ... too. While we as retro modders love dealing with limitations, there are limitations that are fun and those which are not. One can (and many do) make oldschool mods if you like, but I see no reason to emulate DOS experience (usually the bad parts of it). If you grew up using DOS, you can find it and the DOS PC's limits much more acceptable. But it didn't happen with me. I grew up around cheaper computers like the Commodore 64, Apple II, the Tandy Color Computer, and some TRS-80 Model II computers that a school probably got second-hand. The memory limits are the main reason I've moved on from DOS Wolf3D mods. The "visible objects" limit is my most major gripe with DOS Wolf3D (especially with mapping), and even Id themselves couldn't always work around it (E4L8). You can't increase the number without sacrificing other things, and sooner or later, you realize that the "640K barrier" prevents your mods from evolving beyond a certain point. Is there some way to recreate the authentic DOS experience within a 4SDL EXE? Like Chocolate Doom did for the original Doom. It would probably be *less* work to emulate Wolf3D DOS than it would Doom DOS. I'd say it would be more time-consuming than difficult. Perhaps the trickiest part would be that Adlib-related quirk where the music slows down when you rub against a wall or hold down the Spacebar. This seems to be because the IMF playback is mixing in the additional sound effects with the music. Another very weird quirk seems to occur only much older systems (or lower CPU settings on DOS Box). When you get killed - and the music is supposed to stop - there's this slight possibility that one of the IMF instruments will play another note - and just keep playing it - until the level's in-game song replays from the beginning (or the High Score music starts playing). This has happened to me numerous times, but I keep forgetting to mention it when DOS-related bug topics come up. For what it's worth, there is 5500+ near bytes of unused stuff in DOS wolf3d already for the taking I've noticed (I documented what I found so far in the diff here | #define KEEP_UNUSED). With that I was able to bring MAXVISABLE up to 200 (900 bytes), double MAXSTATS and MAXDOORS and raise MAXACTORS by quite a lot in the Apogee v1.1 exe without sacrificing anything else. If your images remain at 64x64, certainly. When you increase the images to 128x128, it becomes a different story. Passage to Hollenteufel has a DOS version. All-in-all, I think its the fact SDL is just much easier from the author's standpoint and from the player's standpoint. DOSBox is just too much of a hassle for a lot of people and the memory constraints can be a pain to workaround. I avoid using it if I don't have to. I actually find that DOS games/mods are best played on vintage hardware that hails from the era or at least the Windows 9x era. I have a different perspective on this than most other Wolf3D players. Now I'm just waiting for the "I don't think you understand"/"No, what I really meant was..." reply. Close, but it was the "well I plan on adding this feature with my superior skillz!1!" spin-off this time. The reason I have superior skills is that what I do outside of Wolf3D requires a completely different level of skill. For the past 5 years, I have been doing hardware graphics programming with OpenGL. I have just started doing it with Vulkan (Vulkan is the successor to OpenGL). To get a sense of how advanced modern hardware graphics programming is, take a look at the Vulkan specification. You will never think programming Wolf3D is difficult again. Because of this, I tend not to be impressed by Wolf3D mods that focus on source code changes. I like mods that actually improve aspects of the game (which may or may not involve source code changes). Very few mods do this; most Wolf3D mods are just clones of the original game. The impression I have is that most people that create Wolf3D mods are not actual computer programmers. Most of the coding questions that are asked in these forums are things that an experienced programmer could easily figure out on their own. DOSBox is just too much of a hassle for a lot of people and the memory constraints can be a pain to workaround. I avoid using it if I don't have to. DOSBox is designed to run old software, not new software that uses an old operating system. I actually find that DOS games/mods are best played on vintage hardware that hails from the era or at least the Windows 9x era. DOSBox actually gives a much more authentic experience than my first Windows 95 computer did. See this thread. I do have plans to make more "trick" levels for The Devil's Attack (my add-on which is a spiritual successor to Temporary Insanity). I've thought of some amazing tricks that have never been done before. One of the new levels ("Boltzmann Brain") is a level that I have been planning to make for 4 years, but haven't done yet. I hope to do it within the next month or two. In this level, you will start out in a red brick area. As you explore this area, you will be struck by how "rich" it is -- it is lit by chandeliers, and many items are visible behind columns on the walls. You will notice that it is possible to get some of those items, and wonder if it is possible to get all of them. The chaingun? The extra life? The blue key? Soon, you will find a gold key, and it will unlock one of two locked doors that lead to a gray stone area. As you explore that area, things will seem to be normal. But something has happened that is one of the most bizarre, and creepy, things ever seen in Wolf3D. When you attempt to return to the red brick area, you will be stunned. The memory of that area will haunt you forever. I think the #1 most important thing when working with DOS is memory management. As Chris said, there is a ton of unused junk in the code (quite a lot of which is leftover from Catacomb3D) that will give plenty of memory to work with. Have you ever compiled the Blake Stone source? Despite adding tons and tons of extra stuff, there are still nearly 2,000 bytes of "near" memory left over (not sure how much "far"). While I agree that such tight limits can be frustrating sometimes, limitations encourage creative solutions and tidy, efficient code. And I'm not implying that you are guilty of the opposite, Tricob. Passage to Hollenteufel has a DOS version. You make some good points there, Matthew. But I don't think there was ever any illusion that we're professional game designers and/or programmers here. And that's perfectly OK; Wolf modding is just a hobby, and we all have lives outside of it that take a slightly higher priority. That sounds interesting, I'm looking forward to seeing that. Of course not. Part of the reason I hoped ECWolf would take off more than it did was because a non-programmer copying and pasting code he/she doesn't understand into an engine he/she also doesn't understand using Notepad or whatever is tempting fate. I don't see the point of making this distinction, especially since DOSBox is likely to be the reference system for people developing new DOS software unless they have a real 486 on hand. 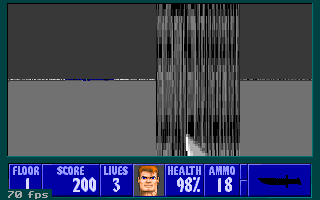 However, the problem with DOS Wolfenstein is less DOS itself than the engine being in 16-bit real mode. Wolf4GW (a 32-bit engine using a DOS extender) was a tremendous improvement, allowing access to 32MB of memory, but the existing DOS tutorials didn't work and raised memory limits don't really screenshot well, and then SDL happened. I think it would be fun to have a DOS port of Wolfenstein Missions, but it would have to be for Wolf4GW because of the quantity of assets and the size of the later maps. Chris' puny 5KB won't make a dent in a mod that has eleven unique enemy types (no sprite swaps! ), eight weapons, and at least 200 different walls. I would also need a real programmer because all the simplified DECORATE, xlat, etc. code that depends on ECWolf would have to be redone as C code that can stand on its own without ECWolf's systems (way too slow and inefficient for DOS) supporting them. Even if you had a John Carmack-level brain in the actual '90s working on it, I can't see Wolfenstein Missions working with anything less than a 386 and 4MB RAM. One of the maps (Barry Christian's secret level) is 128x128 with 461 guards and almost 2000 static objects. The other levels are smaller (64x64 to 80x80) but still vastly in excess of DOS limits, especially with the number of static objects. If anyone's interested, here's an EXE for DOS (NOT Wolf4GW) that allows 128x128 maps, 2000 MAXSTATS, 500 MAXACTORS, 250 MAXVISABLE, and 90 MAXWALLTILES. 200+ walls could be achieved by increasing the size of tilemap, but that would then require shoving that array into far memory, and I haven't found a way to get that to work properly yet. It shouldn't be a problem if the map doesn't have an open area much wider than 64 tiles. If I find a fix, I'll let you know. After adding all this, I still have just over 2k left of near memory, so there's still room for more. And that's by no means the limit, I could add lots more after shoving extra stuff into far memory. I'd like to thank a certain Chokster for its Memboost.zip & Christina_diff.txt! Enjoy, and Long Live DOS! This occurs in vanilla Wolf3D as well. It can occur if you have a map where the player can look outside the level. If you go out the east side of the level, you will first encounter a wall of blocks, and then a large, open area, with another wall of blocks in the distance. In the north and south directions, "tilemap" data repeats, shifted one tile to the side, every 64 tiles, so if you look north or south when in that area, you will be looking across an infinite distance, and that will occur. The game will also slow down, because the raytracing takes so long. It also is possible to have a level that extends beyond 64 tiles without repeating, by shifting in the opposite direction, so the player ends up in a different area of "tilemap" when going out the north or south side of the level. I have been planning to use this for some of the new levels in The Devil's Attack. I already have used it in E2 L3, which I designed back in 2002. The exit elevator on that level is located out the south side of the level. One of the new levels will have a corridor that is one tile wide, and extends for a very long distance to the north, going far outside the level and shifting one tile to the left every 63 tiles. Unlike E1 L1, this corridor will not be infinite; the player will eventually reach an area with an elevator. I have already tried creating a test map with this. Because the corridor is only one tile wide, and shifts one tile to the left every 63 tiles, this bug usually doesn't occur, but sometimes does briefly. I also have tried creating a test map with an ultra-long corridor that is about 5 tiles wide. This is accomplished by making it shift one tile to the left multiple times before going outside the level, instead of just once. With that map, this bug occurred whenever the player looked across to the other side of the corridor. When this bug occurs, the game will often crash with a "divide error" message. Presumably, this is a divide by zero. I haven't looked into why this bug occurs, but presumably, the raycaster isn't properly programmed to trace across distances far longer than 64 tiles. I have never used 128x128 maps. Does that feature have the raycaster modified to support the larger maps? Or does it just have the size of the map increased? Yeah, there were several "shl (dest),6" instructions that needed the 6 changed to 7. It's quite on the cards that I missed something, since I don't know ASM very well... But other than that glitch, everything else seems to work fine.